One of the nice features of Microsoft Outlook 2016 is its ability to show weather for various locations worldwide through foreca.com. By default, Outlook is set to show the weather in Fahrenheit. However, if you are located in a country where the temperature is measured in degree Celsius, this article will discuss how to change Fahrenheit to Celsius in Outlook calendar weather display. Click on File > Options. The Outlook Options dialog box will open. Click on Calendar from the left pane of the dialog box. Scroll down to the options for the Weather and select the Celsius radio button. Now the weather will be displayed in degree Celsius. If you wish to revert back to showing the weather in Fahrenheit, you can follow the same steps above and select Fahrenheit from the options. Here is another cool trick. 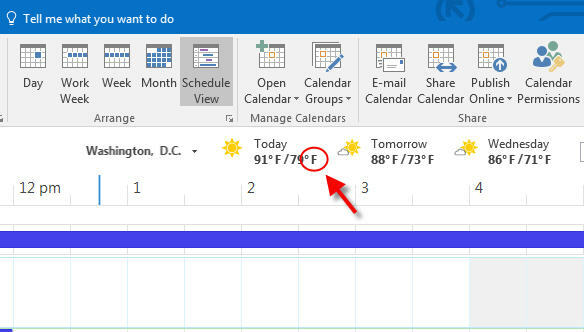 By default, Outlook 2016 displays Washington, DC as the default location for the weather. You can add additional locations by clicking on the arrow icon next to Washington, DC and selecting Add Location. When Outlook 2016 restarts, Washington, DC returns as the default location for weather. Unless you live in Washington, DC and wish to display the weather for a another city instead, simply click on the arrow icon next to Washington, DC again and click on the x icon next to the city name. This will remove Washington, DC from the list of cities and only display your selected city next time you start Outlook.